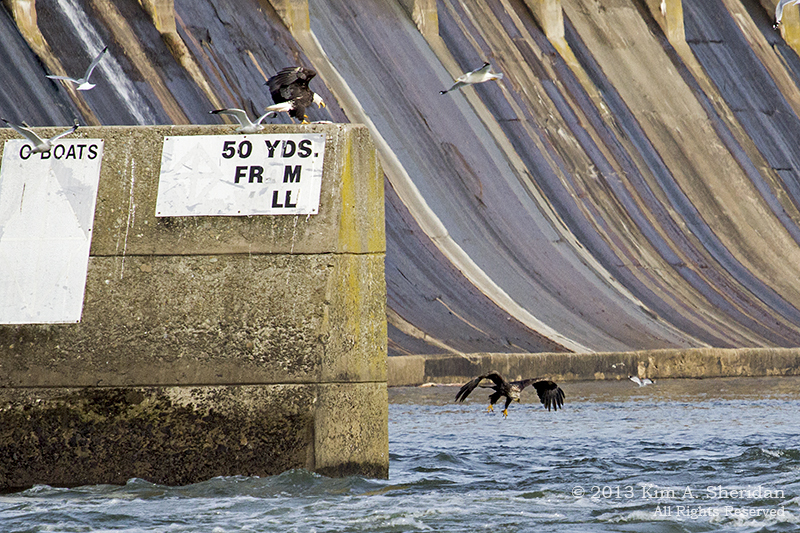 Life’s tough when you’re a juvenile Bald Eagle trying to get your share of the Thanksgiving feast at Conowingo Dam. Young fellows like this one above have to fight for their meals. It’s all tough love once an eagle reaches adolescence. It takes four or five years for a Bald Eagle to reach maturity. They won’t get their characteristic white heads and tails until that point. Before then, their plumage is primarily brown, mottled with varying amounts of white. Remember being stuck at the kids’ table on holidays? Now imagine that just when a nice plate of food is served, one of the grown-ups suddenly steals your place, and your food. Only to have an adult swoop in, chase him off and settle in to enjoy the ill-gotten gains, while he’s left to beat an unceremonious retreat. Fun Fact: Bald Eagles are thieves by nature. They will harass each other and other birds like Ospreys until their victim drops its prey. They also eat carrion when it’s available. Probably why Benjamin Franklin dismissed them as birds “of bad moral character”. 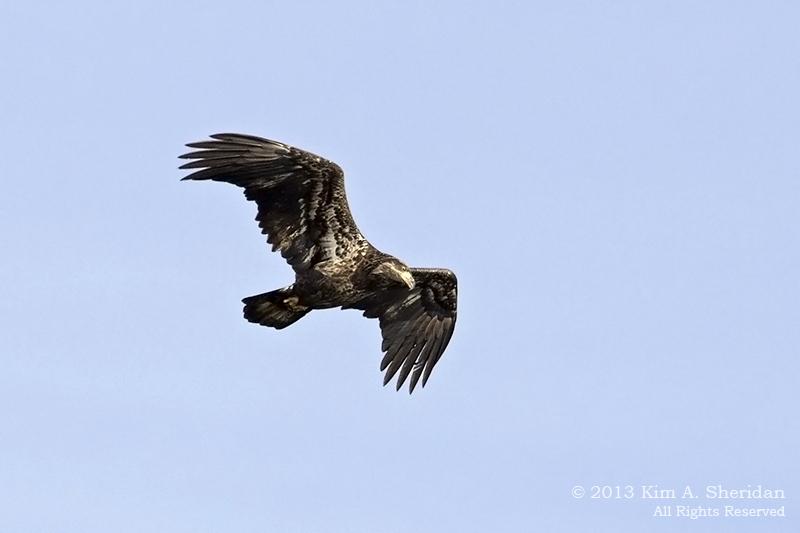 Juvenile eagles must learn how to catch prey. They do this by watching their parents when they’ve first fledged. 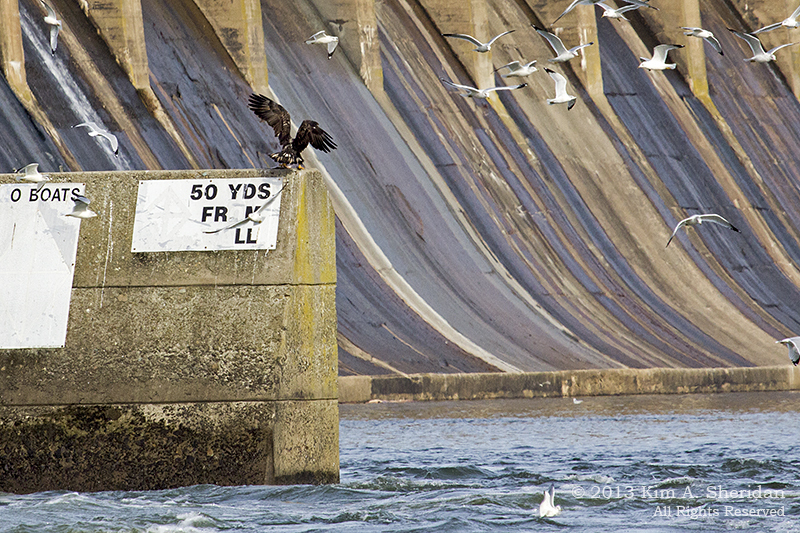 Gatherings like at Conowingo offer juveniles invaluable opportunities to watch the adults fish – and steal fish. Even thievery must be learned. It’s all a life lesson. If juvenile eagles don’t learn to stand up for themselves, they won’t survive. Here’s a plucky youngster trying his best to steal a part of an adult’s dinner. The adult is having nothing of it, however. Hey, can’t fault a guy for trying! 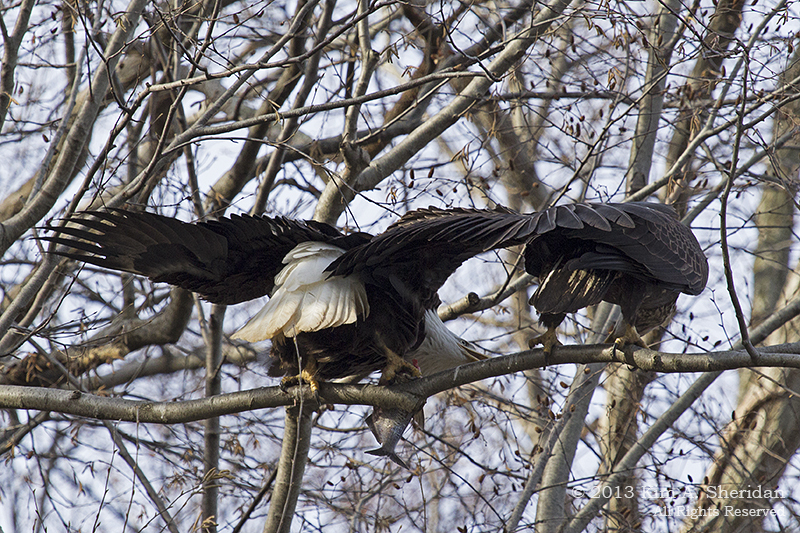 I wonder if either of the two eaglets that were born at Heinz Refuge this spring is among the juvenile eagles at Conowingo this fall. Fun Fact: Eagles have extraordinary eyesight, far sharper than ours. They can spot a fish in the water from hundreds of feet up, all the more remarkable because most fish blend in with the riverbed below. Dead fish are easier to see, as they usually float with their light bellies up. 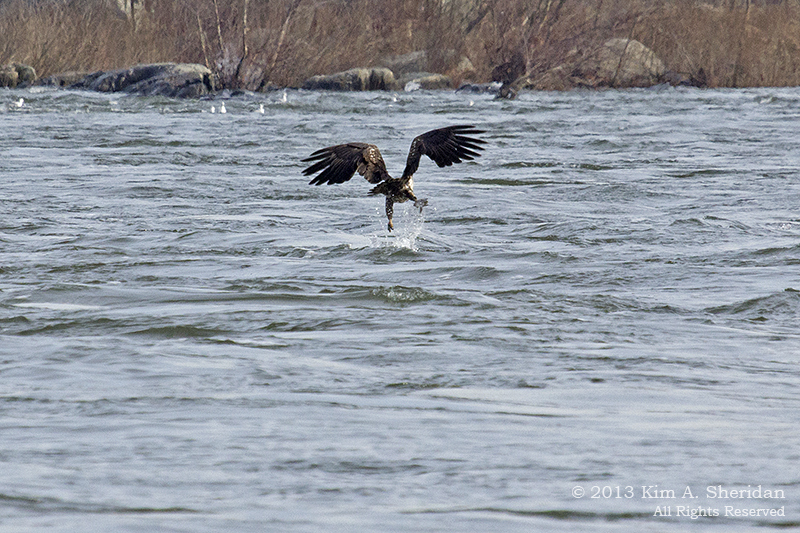 Young eagles still learning to hunt sometimes goof and attack plastic bottles instead. Gotcha! What this young eagle lacks in style, he makes up for in fish. 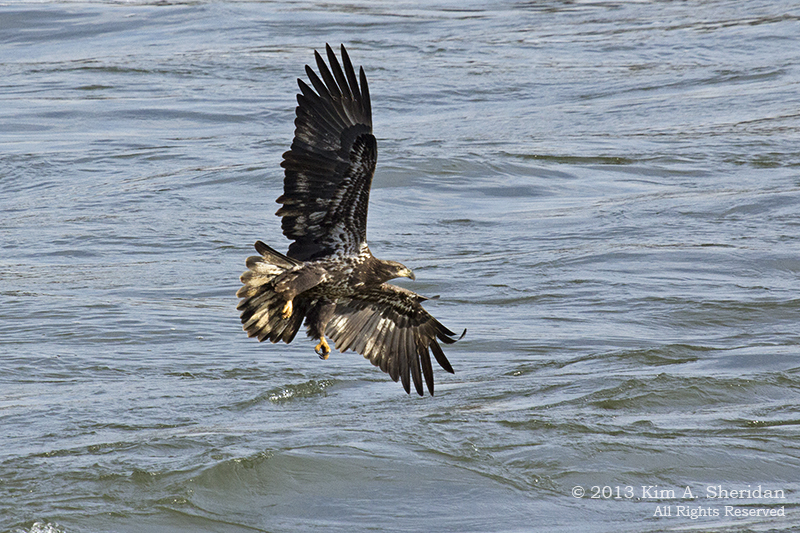 This entry was posted in Nature and tagged Birds, Eagles by Kim. Bookmark the permalink.